Organizations deploy Office 365, to ensure continuous availability of resources to their employees and enhance their productivity. But this burdens the administrators with the additional responsibility of managing the cloud-based environment as well. Apart from the traditional on-premises Active Directory, they now have to provision and manage users' identities and access to the cloud-based resources, manage the licenses of their cloud based environment. Besides the native AD tools, Exchange management console, etc. they have to struggle with and master the likes of Office 365 admin center (OAC), Exchange admin center (EAC), PowerShell scripting, etc ., to maintain order in both worlds. ADManager Plus, on the other hand, helps you address the challenges of managing and reporting the cloud-based Office 365, with ease. 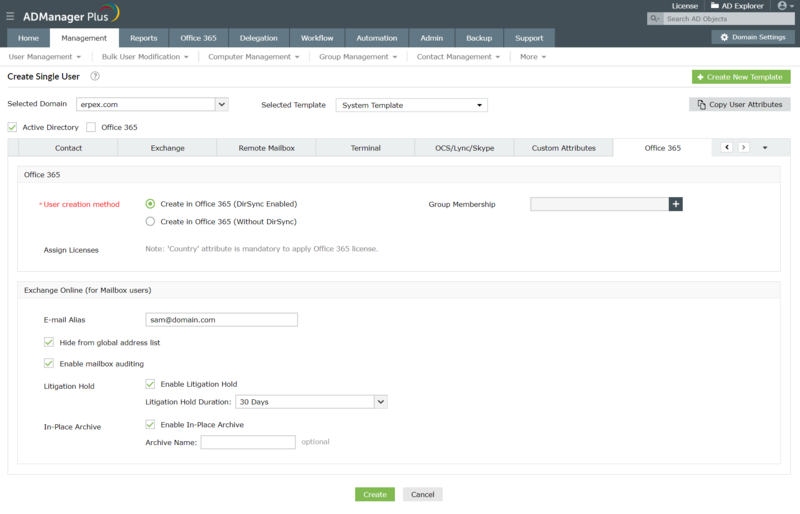 It lets you manage the existing Office 365 users, individually, as well as in bulk. Further, when you create a new account for a user in the conventional Active Directory, this tool gives you the flexibility to automatically create an Office 365 account as well for that user, from a single web-based console. You now have the luxury of managing user accounts in both on-premises and hosted environments, without struggling with numerous tools. This parallel provisioning of user accounts simultaneously, in multiple platforms, ensures that employees get the required privileges and access to all the relevant resources immediately, and start being productive right away. What's more, ADManager Plus lets you create shared mailboxes in your Office 365 environment and offers extensive Exchange Online management features such as distribution and mail-enabled security group modification, disable/delete remote mailboxes, enable/disable email forwarding, and more! ADManager Plus requires MSOnline PowerShell module for Azure Active Directory for managing Office 365 accounts. The option to automatically install the MSOnline PowerShell module for Azure Active Directory is available in the Office 365 settings in Admin tab. Create users in AD, Office 365, Exchange, and more, simultaneously. Create accounts in Office 365 for the users already present in your AD. In one seamless process, you can provision new accounts for users, individually as well as in bulk ( via CSV import and templates), in Active Directory and Office 365 simultaneously. Note: ADManager Plus lets you create users not only in AD and Office 365, but also across G Suite, Exchange Server, and Skype for Business / Lync / LCS / OCS, in one swift action. You can also provision Office 365 accounts for your existing AD users, individually as well as in bulk. Simply specify the desired AD users via CSV import or multiple selection, and their Office 365 accounts are created in a jiffy. Create user accounts in Office 365 without assigning licenses. Create user accounts in Office 365 and also assign appropriate licenses. Office 365 Users: This report provides the list of all user accounts present in your Office 365 setup. Inactive Users: You can use this report to identify all the inactive users in your Office 365 setup. Never Logged On Users: Using this report, you can identify all the user accounts in your Office 365 setup who have never logged on. ActiveSync enabled users: This report generates the details of all the ActiveSync enabled users in your Office 365 environment. License Details: This report gives you a complete picture about all your Office 365 licenses. In fact, for each license, this report offers in depth details like the number of active units, number of units used, units in warning state, the suspended units and the number of locked out units. Licensed Users: You can use this report to identify all the users in your Office 365 setup to whom a license has been assigned. Further, this report also displays all the applications or services that each Office 365 user has access to. Unlicensed Users: Using this report, you can identify all the user accounts in your Office 365 setup to whom no license has been assigned. All Groups: This report helps you identify all the groups in your Office 365 environment. Security Groups: View all the Office 365 security groups using this report. Distribution Groups: This report displays all the distribution groups in your Office 365 setup. Group Members: The Office 365 group members report lets you view all the members of desired Office 365 groups. ADManager Plus provides this report to list all the Exchange Online shared mailboxes in your organization. You can view details such as proxy addresses, permissions, and more using this report. Create shared mailboxes in Exchange Server, as well as in cloud-based Office 365, from a single console. Assign values for various policies and attributes such as delivery restrictions, ActiveSync policy, and more, during the shared mailbox creation process. Delegate the responsibilities of shared mailbox creation to help desk technicians. Select the option to create shared mailboxes in Office 365 with DirSync enabled or disabled. Distribution group and mail-enabled security group modification: This capability allows you to modify distribution groups or mail-enabled security groups present in your Office 365 environment. Disable/delete remote mailboxes: This feature lets you disable or delete remote mailboxes. You can also choose to disable only the archive of a remote mailbox. Mailbox delegation: You can grant full access, send on behalf, and send as permissions for Office 365 mailboxes to specific users and groups. Hide from address lists: You can hide or unhide specific users from address lists. Email forwarding: You can enable or disable email forwarding, configure the forwarding address, and more. In short, ADManager Plus gives you the freedom and flexibility to manage and report on not just the traditional on-premises Active Directory, but also Office 365, which is based on the cloud-based Azure Active Directory. Download its 30-day free trial to experience the ease and advantage of managing and reporting on Active Directory, Office 365, Exchange Server and also Lync/LCS/OCS, using just one web-based tool.